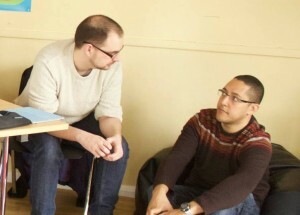 The Academy of Spiritual Leadership, a one-year training experience, aims to help young adult Christians from across London deepen their spiritual life, clarify their vision, sharpen their leadership and broaden their network. They are encouraged to discern God’s vision for their lives, and are equipped with leadership skills to help them make that vision become reality. This happens through a combination of Content (training workshops), Coaching (monthly conversations with a trained coach), and Community (a series of evening gatherings for encouragement, accountability and prayer). Darren Quinnell has been on an exciting journey since signing up to the Academy. An evangelist, former youth worker and video communications specialist, during the Academy year he set up www.boxofquestions.com as a youth discipleship tool. Short videos exploring questions of God, faith and life are available to help young people find answers in Jesus to the questions they have. Darren said the Academy gave him, “Skills for everyday work and social life that will improve the way you think and interact with others,” and also helped “refocus on vision and mission” in a way that helped develop Box of Questions to what it is now. Other visions being worked out by those who have been through the Academy’s programme include running a Christian-Muslim dialogue group at a major London university, developing the infrastructure and economy on the island of Montserrat and setting up a Christian café and missional community in the City of London. To find out more about One Rock International and the Academy of Spiritual Leadership visit www.onerockinternational.com/london.